Our Medical School consists of six basic science and eighteen clinical departments that have the responsibility for pre-clinical and clinical instruction of medical students, as well as university-wide responsibility to students in other schools on the campus. 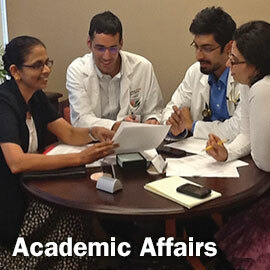 We offer more than 20 exceptional residency program choices. Currently, there are 500 plus residents and fellows with more than 800 clinical faculty to support their training. All residents and fellows have faculty appointments as clinical assistant instructors.